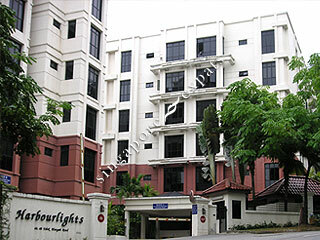 Harbourlights condominium is a low density development located opposite Harbourfront (World Trade Centre). The living room and all the bedrooms have floor to ceiling glass windows which enhance the beautiful greenery view for units facing the lush forested Mount Faber. Harbourlights is near to the Central Business District and Sentosa. There are plenty of amenities surrounding this condo and the Harbourfront MRT station is directly opposite the condo. If you’re considering this place, my advice for you: dont! We’ve stayed there for less than a year and decided to terminate our contract few months earlier because its just unbearable. The security guards are very loudsy so as the management, they never smile. Despite us staying there and seeing them every day, they’d be rude to our friends and family and wouldnt recognise us if we happened to forget to bring the card, ended up asking rude questions or letting us wait for people to enter- go out to follow them through the door. The entire place is very mouldy! The aircons need to be cleaned almost every month else they turn healh hazardous! We also invested a lot on air humidifiers but furniture catch mould instantly after big rains. Not great for kid, almost no greenary, worn down play ground (which is tiny) and barbecue station and gym. Worst condo we ever stayed during the past 5 years, only good thing is location. -landlord will pay repairs in the begining then will ask you to pay for everything and will keep your deposit at the end. Be ready for a lot of expense that in the end will increase the monthly rental. -the only good thing about this condo is the location. -but so many great condos in good condition on the market at the moment for the same price! Have been living there for 3 months. The location has most amenities and is very well connected to many parts of Singapore. Peaceful & quiet place with fair, friendly and helpful management office and staff. Very convienient and easy access to harbourfron MRT. So close to Vivocity shopping centre and Sentosa! Really like the place and locality. Quiet pleasant condominium, yet easily accessible to VivoCity mall, Sentosa and only 2 minutes' walk to Harbourfront MRT station. Value for money for such a location! Great environment and convenient location for rental. Avoid this condo .. most of the condos are old more than 20 year and MOST tenants have bad experience with landlords .. they dont return deposits.